Everyone loves the familiar Weeping Willow tree (Salix babylonica). Its graceful, ground-sweeping branches are easily recognized by all. Weeping willow is an ornamental tree can grow up to 8 ft. a year, giving you a beautiful fast growing shade tree. Add a Weeping Willow Tree to your yard for a graceful look. This short-trunked tree has long, drooping branches, a character which gives it its common name. 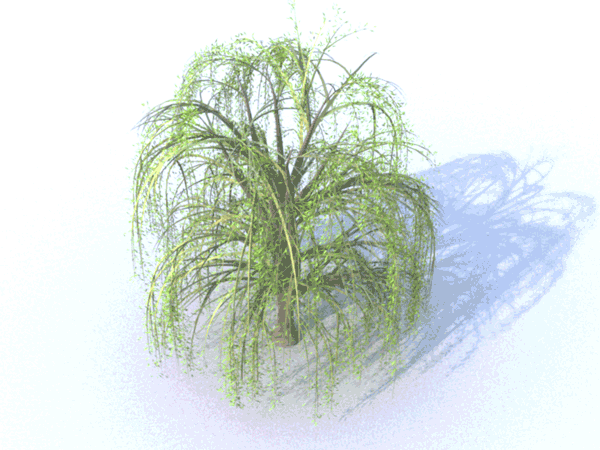 The weeping willow is a native of the extra-tropical Asia, is undoubtedly the most well-known of all willow trees, but it's by no means the only willow. 3ds tree, branch, bark, white, salix, trunk, side view, solid, isolated, foliage, natural, green, dense, wide, seasonal, render, leaf, botanical, botanic, environmental, ecology, summer, broadleaved, rendered, illustration, flora, wood, tall, stem, high, plant, huge, nature, image, large, environment, ecological, timber.